Nicaragua is a country in Central America. It has coastlines on the Caribbean Sea and the North Pacific Ocean, as well as the most substantial body of fresh water in Central America, Lago de Nicaragua. It is a very welcoming country, and you will have a lot of fun there. Plenty of tourist attractions are waiting for travelers from all around the world, and the best thing you can experience while in Nicaragua is the rainforests of the Rio San Juan River. Of course, that can be subjective, but nature will always be one of the most appreciated things a country has to offer. Other than that, make sure to check out the Mombacho Volcano. It is located 30 minutes from Granada, and you can see beautiful flora, as well as monkeys and birds. Before taking a trip to Nicaragua, you must see whether or not you need a visa. Lucky for you, the visa policy of Nicaragua is quite liberal. The citizens of 91 countries and jurisdictions can enter Nicaragua without a visa, and they can stay for up to 90 days. That does not mean you do not have to pay the Tourist Card. It costs $10, and you can get it on arrival. 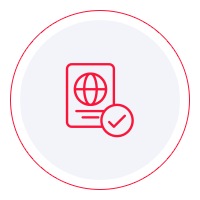 Visas on arrival are also available for the citizens of 73 countries and territories. All the other nationalities must obtain a consular visa at the nearest Nicaraguan diplomatic mission. To find out quickly if you need a visa or not, you can look at Nicaragua’s visa policy yourself, but with iVisa’s Visa Checker, things are faster. The tool is easy to use and makes the information you need available in just a few clicks. First, you must click on the button that says Visa Checker. You can see it in the top right corner. Then, you must select your country of origin in the drag-down menu on the left and Nicaragua in the right menu. The result will display whether or not you need a visa. And if you do, you will receive some useful information such as a list of the nearest embassies. At the moment, iVisa cannot process Nicaragua visa applications since there is no electronic visa available. Even so, we would like to help you in any way we can, which is why our support service is available to you 24/7 and is free of charge. If you find out that you do need a visa for Nicaragua, you must do some research and see what the requirements are. You can find a lot of information online, but we think that you should use that as a reference only. A diplomatic mission or an embassy will always be the most reliable source of information. You should contact them before going down there. In the meantime, what we can tell you is that you need a valid passport that does not expire for another 6 months from the date of arrival in Nicaragua. You must also have proof of subsistence and documents for your next destination. For the moment, the information above is all we can assists you with, but we hope that you find it useful. For further information, feel free to contact us.